Thoroughly enjoy the Outer Banks. This itinerary has a little bit of everything. A slew of history lessons. The telling of an epic unsolved mystery. An in-depth look at our past and present maritime culture. Four days of shopping, sights, sounds and Outer Banks surprises. NA Late afternoon arrival to the Outer Banks of North Carolina Check in to your Rental Property or Hotel. For Dinner, be sure to choose from one of our locally owned restaurants, which feature North Carolina seafood. 8:00am Breakfast at your hotel or rental home, or visit one of our local family restaurants and savor a good ole southern breakfast. 9:30am Tour of the Elizabethan Gardens (1 hour). Stroll through the majestic gardens, which were designed as a living memorial to Queen Elizabeth and the Lost Colony. A highlight of the gardens is an outstanding collection of antique statuary. Then simply walk next door to your next tour. 10:45am Fort Raleigh National Historic Site/Lost Colony Backstage Tour (1 hour). Sir Walter Raleigh’s explorers and colonists attempted to found settlements here on the north end of Roanoke Island in 1585. Also located here is the Roanoke Island Freedman’s Colony. The Freedman’s colony is recognized as an historic National Underground Railroad Network to Freedom site. The Waterside Theatre is also on site is and is where you will start your backstage tour of The Lost Colony, a symphonic outdoor drama. Backstage tours need to be set up in advance. 12:00pm Lunch and shopping on own, Downtown Historic Manteo (2 hours). After lunch and shopping have the group meet at Roanoke Island Marshes Light and the George Washington Creek (working) Boat shop: The replica of the 1850s screw-pile light that once stood guard over nearby Croatan Sound, will offer visitors a unique glimpse into the maritime history of the island, as well as the lightkeepers who once lived at the station. The working boat shop gives the visitor a glance of the Ella View, an authentic shad fishing boat made from native Outer Banks trees, this fishing boat is an example of the historical boat developed over a century ago at Roanoke Island. Admission is free to both. 2:00pm Roanoke Island Festival Park Downtown Historic Manteo (1 hour). Here you will see the Elizabeth II, a 69-foot sailing vessel representative of those sailed to the New World in 1585. Also we will visit the Roanoke Island Adventure Museum and Settlement Site where you can see what life was like for those early explorers as they arrived on Roanoke Island. 3:30pm Visit the Christmas Shop and Island Gallery in Manteo Since 1967, visitors from far and near have discovered the special magic of The Christmas Shop and Island Gallery with its 36 rooms of holiday fun. An Outer Banks favorite! 4:30pm Shopping at Tanger Outlet Center, Nags Head, NC Shop Tanger Outlet Center in Nags Head, NC and buy direct from over 25 brand name manufacturer and designer outlet stores. 5:30pm For dinner, be sure to choose from one of our locally owned restaurants, which feature North Carolina seafood. Arrive at the Waterfront Theatre for an evening performance of The Lost Colony Outdoor Drama (performance begins at 7:30pm – approximately 2 hours). Experience the excitement and tragedies of Paul Green’s Pulitzer Prize winning symphonic outdoor drama, the longest in the country, tells the story of Sir Walter Raleigh’s expedition of three ships, which included the English men, women and children attempting the first English settlement in the New World in 1587. Please note: The Lost Colony Outdoor Drama held during the summer months of June through August. 7:00am Breakfast at your hotel or rental home, or visit one of our local family restaurants and savor a good ole southern breakfast. Today’s journey will be a long day as you travel through the Cape Hatteras National Seashore. Highlights will be the Bodie Island Lighthouse, Chicamacomico Lifesaving Station, Pea Island Wildlife Refuge, Cape Hatteras Lighthouse, Graveyard of the Atlantic Museum. 8:30am Bodie Island Lighthouse (45 minutes). This 156-foot beacon began operation in 1872 and has the black and white horizontal bans. Complementary interpretive talks can be arranged with the National Park Service, grounds are complementary. 9:45am Pea Island National Wildlife Refuge (stop at the Welcome Center). Located on the northernmost section of the Cape Hatteras National Seashore, this 6,000-acre refuge is a one of the prime birding areas on the East Coast. A haven for more than 265 species of birds such as Canadian geese, snow geese and 25 species of duck during the winter can be seen. Bird walks and other programs may be arranged in advance. 12:30pm Cape Hatteras Lighthouse (1 hour). See tallest brick beacon on the American coast with its black and white stripes, it stands at 208 feet high. Learn the marvelous history, which includes its half- mile move in 2000 away from the ocean. Admission to the grounds are complementary, minimal fee to climb. If time permits, stop by the Old Gray House in Buxton (Light Plant Road), which is owned by locals and has local artists and crafters who display their arts and crafts. The house has been there since the turn of the century. Lots of neat stories! Home is located before the Cape Hatteras Lighthouse entrance. Free gifts for group tour patrons! 1:45pm Arrive at the Hatteras-Ocracoke Ferry Terminal. Before getting in line, quickly visit the Graveyard of the Atlantic Museum. Located at the ferry docks, this museum is still a work in progress, Exhibits now on display include artifacts from historical shipwrecks, unique beach finds and locally carved ships’ models. This is a great spot for a bathroom break before embarking on your ferry ride to Ocracoke Island. 2:00pm Catch the ferry to Ocracoke Island. Enjoy a 45-minute free ferry ride to historic Ocracoke Island. This is where the famous pirate Blackbeard plundered many a ship and was eventually beheaded by a British naval captain in 1718, in a slough off of the island. Reservations are recommended but not required for this free ferry. Lunch on own in Ocracoke at a local restaurant such as Howard’s Pub, Jason’s, Back Porch Lunchbox, Creekside Café, Capt. Ben’s Restaurant. 3:15pm Arrive at the Ocracoke Island Visitor Center Tour to be arranged in advance with a National Park Service interpreter who will give the Ocracoke history and mystery of this quaint fishing village. Stop at the Ocracoke Lighthouse (Windshield Tour). Nestled in this quaint fishing village along Silver Lake, this whitewashed tower is the oldest and shortest. Built in 1823 it is the oldest operating lighthouse on the North Carolina Coast and the second oldest in the nation. It was the beneficiary of the first Fresnel lenses. Other points of interest on Ocracoke Island: Teach’s Hole – Blackbeard Exhibit and Pirate Specialty Shop British Cemetery – located on Howard Street Banker Ponies – pins are located on NC 12 on the way to village - Ocracoke Preservation Museum Ocracoke Island Visitor Center - next to the Cedar Island ferry docks. For dinner, be sure to chose from one of our locally owned restaurants, which feature North Carolina seafood. 7:00am Breakfast at your hotel or rental home, or visit one of our local family restaurants and savor a good ole southern breakfast. 8:45am Jockey’s Ridge State Park (1 hour). See the East Coast’s tallest sand dune and one of the Outer Bank’s most phenomenal natural attractions. Witness flight as it is still practiced today on the Outer Banks with a hang gliding demonstration by Kitty Hawk Kites. 10:00am Wright Brothers National Memorial (1 hour, 30 minutes) See where on a cold day in December, 1903 Wilbur and Orville Wright changed the world forever as their powered airplane, the “Wright Flyer," skimmed over the sands of the Outer Banks for 12 seconds before returning to the ground. See the new flight museum, which still has exhibits from the First Flight Centennial Celebration. 12:30pm Lunch and Shopping in Duck. 2:00pm Currituck Beach Lighthouse at Currituck Heritage Park (1 hour). Visit the only lighthouse in North Carolina that is still housed in its original structure. Built in 1874 this lighthouse stands 158 feet tall. 3:00pm Whalehead Club at Currituck Heritage Park (1 hour). A 1925 restored historic house museum built as private residence by Wealthy Philadelphia industrialist Edward Collings-Knight, Jr. Mr. Knight built this art nouveau styled home for he and his wife who were avid waterfowl hunters. 4:30pm Return to the hotel or rental home for rest and relaxation. 5:45pm For dinner, be sure to chose from one of our locally owned restaurants, which feature North Carolina seafood. 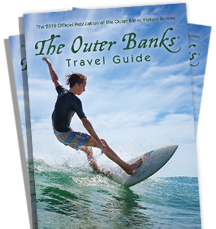 NA Depart the Outer Banks for your homeport!